Home>Articles>Conditions>What Exactly is Venous Reflux? What Exactly is Venous Reflux? Venous reflux refers to the backing up of blood in the veins, which is one of the most common contributors to vascular disease. Venous reflux is responsible for many of the symptoms of chronic vascular insufficiency, including swelling (edema) in the legs and ankles, changes in skin color and texture around the legs and ankles, and varicose veins (thick bulging veins). Your doctor can determine if you are experiencing venous reflux through a series of tests, and help put together a treatment plan to alleviate the pain and symptoms that venous reflux causes. Several factors contribute to venous reflux. When blood clots form due to injury or a blood disorder, they can damage veins or valves, thereby causing venous reflux. Deep vein reflux occurs as a result of deep vein thrombosis (DVT), the formation of a blood clot in the deep veins in the leg. Obstruction in deep veins can cause damage to valves, and cause deep vein reflux. Superficial vein reflux usually occurs as a byproduct of age, where vein walls and valves are weakened as a result of the natural aging process. Sometimes clots in the superficial veins cause superficial vein reflux. Superficial venous reflux can have no symptoms, or can result in reticular veins (small reddish veins), telangiectasias (spider veins) or varicose veins. Part of your treatment plan for venous reflux may include making healthy lifestyle choices which promote healthy venous circulation. Maintaining a healthy weight, eating healthy nutritious foods and exercising regularly will help keep your blood circulating. Walking is an especially good form of exercise. If you stand for long periods during the day, taking breaks to sit down of put your feet up will reduce swelling and inflammation. If you are sedentary most of the day, taking breaks to walk or move your body can encourage circulation. Compression garments are often used either as the primary treatment for venous reflux, or in conjunction with other treatments. Compression socks (above and below the knee) or compression pantyhose can help maintain venous blood flow. More potent forms of compression therapy are also available in cases of severe venous reflux. Sclerotherapy uses chemical injections to collapse a vein. Ablation uses heat to destroy a vein. Laser therapy uses lasers to destroy a vein. Vein stripping (surgical incision and removal through two small incisions) Vein stripping is now considered an outdated procedure by many physicians, but may be prescribed in certain cases. 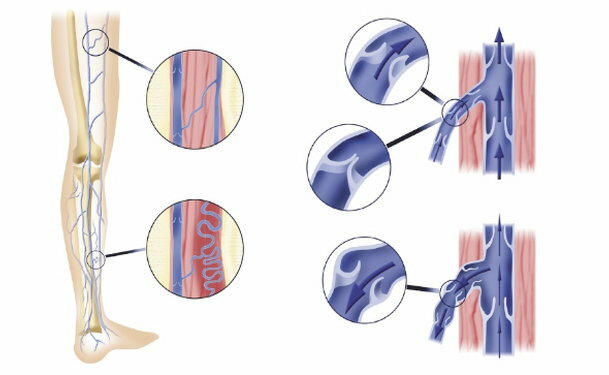 These commonly used techniques are used to seal faulty veins which are refluxing. Vein bypass surgery is used to bypass a clogged vein which is refluxing. Valves can be repaired through using valve repair surgery, which is an invasive type surgery. Edema in the legs and ankles occur when veins become overly full with blood, causing fluid to leak, and legs and ankles to swell. Venous stasis ulcers are slow or non-healing wounds around the legs and ankles which form when blood pools in the veins. Overly full veins can create high pressure and cause breaks in the skin which are slow to heal due to compromised circulation. Varicose veins are created when veins become engorged with blood, producing thickened, twisted rope-like veins visible close to the surface of the skin. Varicose veins can be painful. Reticular veins are thin, red colored veins noticeable at the surface of the skin. Telangectasias, also known as spider veins, are thin, reddish, web-like veins noticeable on the surface of the skin. Both reticular veins and spider veins are rarely painful or problematic to the health. Patients are more often concerned with their cosmetic aspect. Pain is often accompanies the symptoms of venous reflux. Sometime legs can feel itchy or sore. When you meet with your doctor to determine whether venous reflux is affecting your health, your doctor will take a complete medical history and physical exam. Your doctor will take special note of any changes in your skin temperature, color and texture. Varicose veins and spider veins will be noted, in addition to edema or ulcerations on the leg. Your doctor will check the pulses in various places along your circulatory system. If you doctor identifies a need for additional testing, non-invasive vascular testing will be recommended. Ultrasound testing is among the most commonly recommended and important diagnostic tools to identify vascular reflux. Doppler ultrasound is a non-invasive test used to test direction and speed of blood through your veins, Duplex ultrasound is a combination of Doppler ultrasound and B-mode ultrasound (to transmit pictures of your veins). The dual test of duplex ultrasound produces images which your doctor can examine to determine how blood flows through your veins and how well your valves are working.